I've tried this tool on most of the possible scenarios and it worked fine with no problems, in case you have a big amount of chunks you need to be patient because it take sometime. - (With Noise mode) this will bake the same result you achieved in Visualize section to your selection. When you hit this button you're still able to control the Fallof, Noise scale and strength but not the Subdevide plz be carefull, because this will change the vertex order and ruin the result. - (Displacement mode) where you are going to define a vertex selection that is going to transfer into a vertex color once you hit (bake verts color) button. - Finally you have the material section in case you used the vertex color method this button is going to create a material with displacement and bump for your selection. 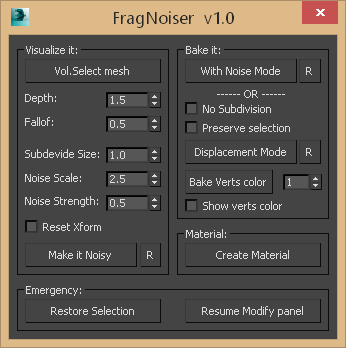 -You are still able to delete all the modifiers that have been added by this script, simply select your frags and hit Restore Selection. -And also if the modifier panel stopped working you will hit Resume Modify panel. Note: please save your scene before trying this tool it stills at early stages and need more improvements, and if you faced any issue don't hesitate to report it. was tested on (2013-2015) it should work with no problem with earlier versions, because it only uses common 3ds max modifiers. Submitted by Alaa alnahlawi on Sat, 2015-02-21 21:56. 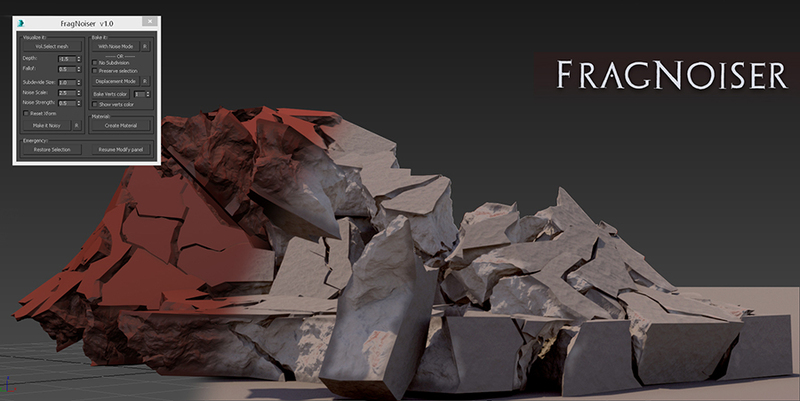 If your question how to feed it to the tool, this is achieved by pressing the (vol.select mesh) and picking the object you want your frags to be affected by. 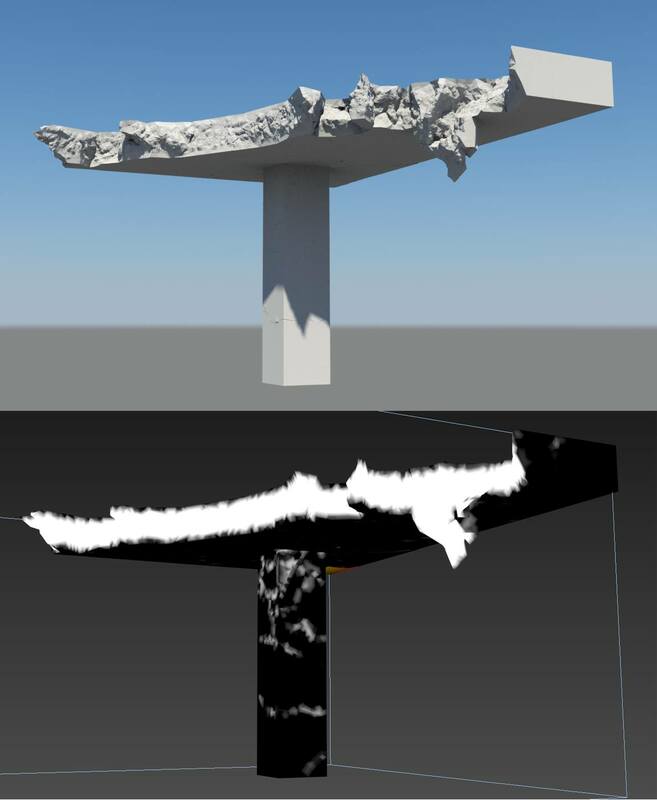 Submitted by aguilarcj06 on Thu, 2015-02-12 03:19.
how to select the volume mesh on the fragmented objects..? Submitted by Alaa alnahlawi on Thu, 2015-01-29 11:32. Submitted by FR_dZastrX on Wed, 2015-01-28 12:17. I was using the "Volume Selector" modifier instead of an other mesh. Submitted by Alaa alnahlawi on Wed, 2015-01-28 08:54. Sorry abit late reply, Strange thing is happening here. if you followed the tutorials and steps you shouldn't face any problem. the selected objects you are trying to apply the noise to. select your stone for example and hit make it noisy. 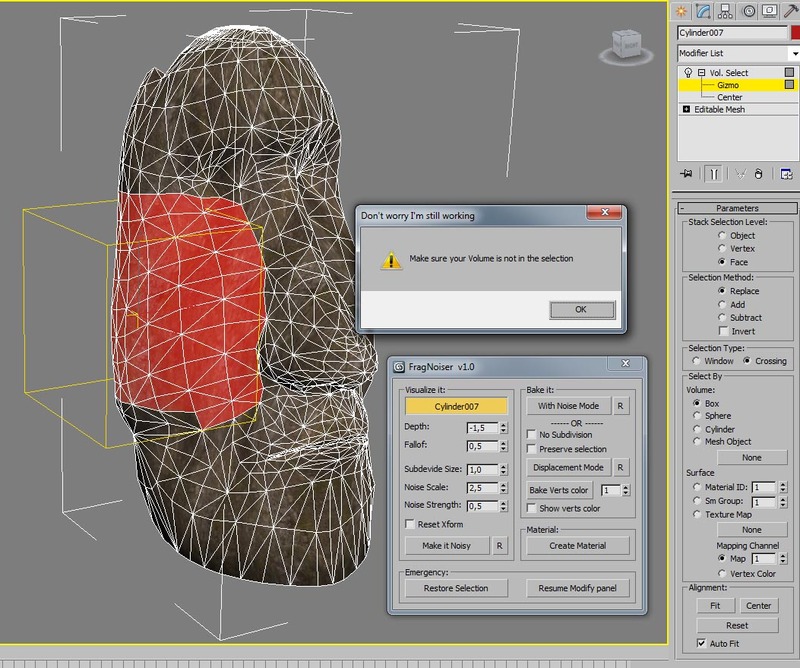 I'm not sure that 3ds max version has anything to do with the error. If you still have a problem plz share your file let me check it. Submitted by FR_dZastrX on Wed, 2015-01-21 07:30. Thanks a lot for sharing this beautiful tool with us all and for free. "Make sure your Volume is not in the selection"
I tried many different meshes and selections but it systematically says that and I don't even understand what that means (?) Please, may you consider confirming this might be a bug, or, otherwise, helping me a bit to figure what I am doing the wrong way ? Submitted by Alaa alnahlawi on Tue, 2014-12-09 10:35. Yup I'm masking by selection or the vertex color, ID will cause unnatural results. This way you can extend the noise effect even to the outer faces in a gradual way. Submitted by sedif on Tue, 2014-12-09 00:13. Thank you for that, its a nice script! Submitted by amartinez1660 on Mon, 2014-12-08 12:25. Sorry, playing further with it saw how the falloff actually works.